After lots of research to make our Jet Bags better, we've determined how to make our Jet Bags the best they can be. 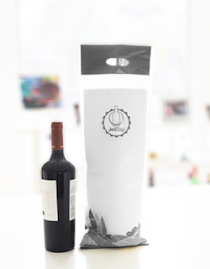 Our inner bags can be purchased separately – making your outer bags reusable if your wine bottle doesn't break! You can buy different designs that suit your style. You can also get them custom made with your own company's logo. Another great way to use our Jet Bags is to transport liquor, perfume, vinegar, or any liquid you purchase that may be contained in a breakable bottle. It's not just for wine! Check them out at our website, www.thejetbag.com.